Porter is Jamaican Rapid King! Peter Myers, "Porter lifts Coore Rapid Title," 23 June 2005 (Clarendon, Jamaica). NM Russel Porter was in devastating form, when he brushed aside a tough field to walk away as the first champion of the inaugural Coore Rapid Chess Open at the Campion College Auditorium on Sunday. The 35 year-old swept aside two of Jamaica's top players, National Masters Geoffrey Byfield and Duane Rowe, on his way to securing 8½ points and a comfortable win. Second place went to Equitable Brown who scored 7½, while third was shared between Brandon Wilson, FM Warren Elliott and NM Geoffrey Byfield, who all finished on 7 points. Sixth place went to NM Robert Wheeler (6.5 points). The best female prize in the Open category went to WNM Deborah Richards (5 points), the top player rated under 1800 was Mark Henry (6 points), the top female prize in the under 1800 category was shared between sisters Melisha and Annesha Smith (4 points each), first place in the under 1600 category was shared between Melisha and Annesha Smith, Brian Hanna, Tewana Mellace, Stuart James and Jared Lewis (4 points each). The Rapid was a five round tournament, played at the rate of 20 minutes per game. Each round consisted of two games, where competitors reversed colours, which took away the advantage of playing first. 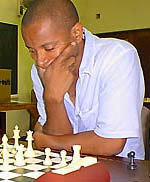 The tournament was sponsored by chess enthusiast Anthony Coore, who wanted to add a new and exciting tournament to the Jamaica Chess Federation calendar.